Clean fish and cut into medium pieces. Heat oil in a Chatti, add mustard, fenugreek seeds, red chillies, Shallots and sauté well. Grind the shallots into paste. In the same pan, add oil and fry the onion paste, ginger-garlic paste, and sauté till brown. Add chilly powder and coriander powder, turmeric powder into it and sauté well. Add Tamarind water into it and put fish pieces into it. Put Curry leaves it and cover and cook till fish is done. Pour coconut oil and server hot. Wash prawns and de-vein. Then marinate the prawns with Green chilli paste, salt and Kudampuli for some time. Now heat oil in a kadai and add Ginger, Garlic and lots of curry leaves, then add chopped small onions. Saute them well. When it become brown add a ¼ tsp of turmeric powder half tsp of chilly powder and ¼ tsp of garam masala powder, salt and stir well. Add prawns to this and mix them well and sauté. 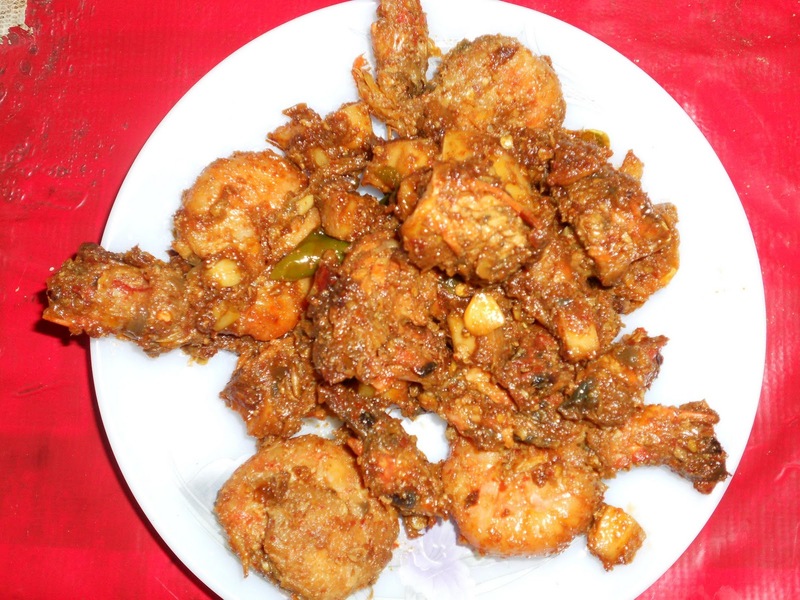 Saute it till brown… tiger prawns is ready to serve ..Serve hot .. In oil fry red chillies, fennel seeds, poppy seeds, black pepper and coconut for some time. Grind it to a fine paste. Grind ginger and garlic. Heat oil in a copper bottom pan. When oil becomes hot add spices, then add chopped onions and fry till golden brown. Add ginger garlic paste and sauté. Then add turmeric powder, coriander powder, chilli powder, garam masala powder, curry leaves and sauté well. To this add sliced tomatos, sauté till the tomatoes chaged into a fine paste and oil float on the top. Then add chicken pieces and ground paste, required amount of water and salt. Cook on medium fire. Boil the florettes for 3-4 minutes with water and a tsp of milk. Drain and make it dry. Make batter using maida , 2 tbs cornflour, red chilli powder, 1/2 tsp each of ginger garlic and salt. Dip the florettes in the batter one by one and deep fry and keep aside. In the remaining oil add remaining ginger, garlic , onion and saute. to this add green chillis, Capsicum, spring onions and fry for a minute. Adjust the salt. In a bowl, mix soya sauce, tomato sauce, chilli sauce, food colour with some water and 1tbs of cournflour , mix it well and pour it to the sauted. Add florettes and Boil for two minutes and remove. Heat the oil in a pan, put ginger and garlic and sauté well followed by onion, tomoto, green chillies, curry leaves and sauté well. 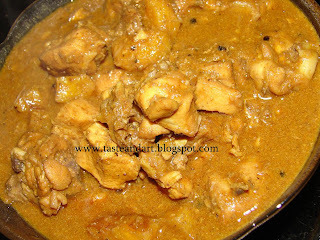 To this add Chicken pieces, coriander powder, turmeric powder, salt and required amount of water. Cover and cook for about 10 minutes. When half done put spices ( cloves, cumin seeds and cinnamon) and pepper powder. Close it and cook again. When the chicken becomes tender, add thick coconut milk and remove from fire. Heat oil in a pan. Splutter mustard seeds, followed by green chillies, ginger and curry leaves. Squeeze the excess water from beetroot and mix it well with the sauted. Crush together coconut, shallots , turmeric powder and salt using hand and mix it well. Cover and cook for 3 minutes on a low flame. Don`t use water while preparing. Cut Achinga Payar length wise. Pour Oil in a Pan. Splutter mustard seeds followed by curry leaves . shallots and crushed redchilli. Saute well. Add the half cooked payar to this and mix well. Close the lid and cook in low flame for a minute. Open the lid and saute until it turns dry.